For the average movie-goer, our relationship with cinema often begins in childhood; saucer-eyed we stared at flickering screens as the adventures of Jason, Bastian or Wall-E shone back at us. Rarely, however, were the escapades on-screen OUR stories - they were heroes from a distant land, a million miles away from the languid euphoria of childhood. 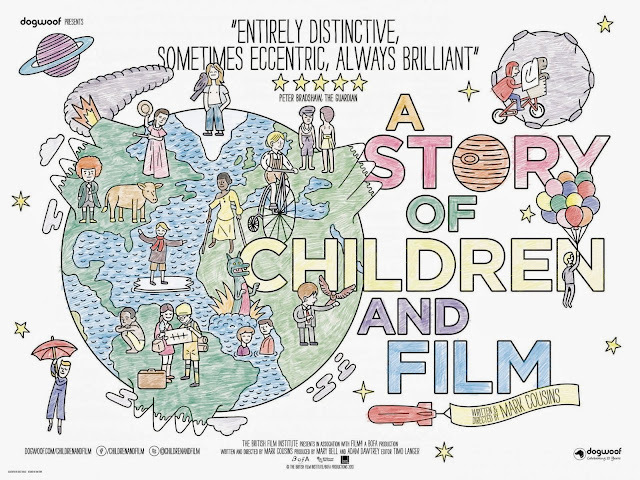 Mark Cousins, film-critic, director and all round delightful human being, investigates the cinematic story of children, and childhood, in his latest essayist film. Following on from his epic odyssey through the history of the moving image itself, A Story of Film, Cousins' tightens his focus to examine how childhood has been portrayed onscreen throughout the medium's history. A bewildering, ecstatic journey unfolds - from the well-known (E.T.) to the more obscure (Palle Alone in the World), the Northern Irish auteur creates an intense collage of cinema at its most powerful and profound; his lilting, awe-struck voice-over hammers home the majesty of what we are seeing and transcends his subject matter to elegiac poetry. Throughout A Story of Children and Film, Cousins' reconnects us with the overwhelming joy of discovery many of us have lost as we have aged - hearing Cousins' rhapsodise over Crows, for example, is a gleeful experience. His passion is contagious. The film utilises clips from scores of movies only the most committed of cineaste would be familiar with. Another flashback to childhood is granted - at the conclusion of A Story of Children and Film those not well-versed in the cinema of Mohammed-Ali Talebi (et al) can set themselves a long-term homework project to track down and view a patchwork of cinema's most beautiful triumphs. Cousins' film then, simultaneously reminds us of our past and makes our futures glisten with excitement too.